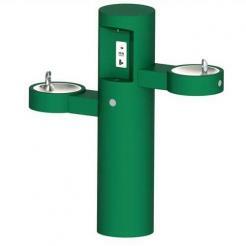 GYQ84 Series is an Outdoor Pedestal Bottle Filler. 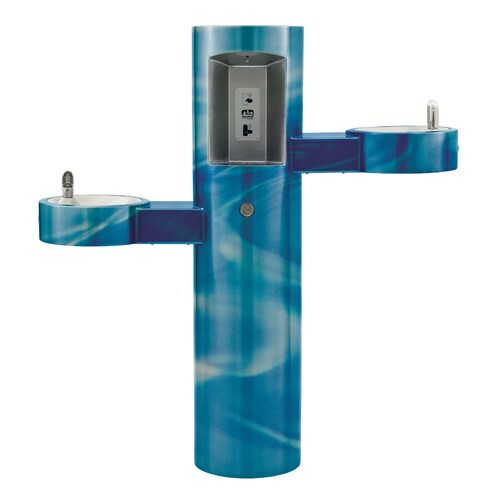 The unit has dual barrier-free arms featuring drinking fountains. Bottle fillers shall be activated by a 9 volt sensor or a pushbutton as standard. Unit shall contain a 100 mesh inlet strainer, lead and cyst filter, 6-AA battery pack and laminar flow spout. A pet fountain version is available with a -PF suffix option. Pedestal mounted bottle filler with bi-level drinking fountain shall be Model GYQ84. Construction shall be 12 gage, all stainelss steel with 18 gage stainless steel fountain bowls. Pedestal shall have four mounting holes. Access covers shall be secured with vandal-resistant stainless steel screws. Bottle filler shall be activated by a 9 volt sensor or a pushbutton as standard. Unit shall contain a 100 mesh inlet strainer, lead and cyst filter, 6-AA battery pack and laminar flow spout. Self-closing pushbuttons, needing less than 5 pounds force, shall be activate internally mounted valves with adjustable stream regulators. 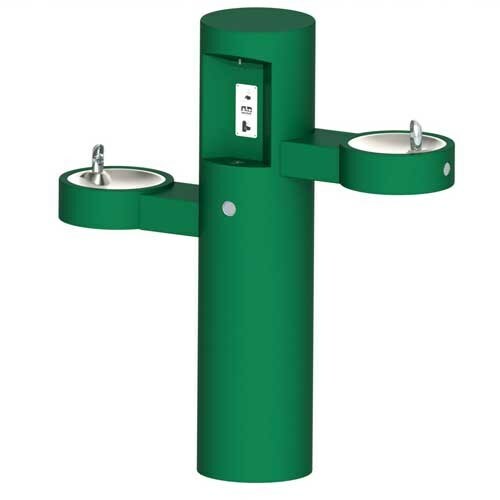 Bubblers shall be stainelss steel with non-squirt features and operate on water pressure range of 20-105 psig. Fountain is cretified to ANSI A117.1 Public Law 111-380 (NO-LEAD), CHSC 116875 and NSF/ANSI 61, Section 9. Fixture meets ADA and ADA Standing Person, requirements when mounted appropriately. Lead Time: 2-4 weeks before shipment. This item is "Build to Order".